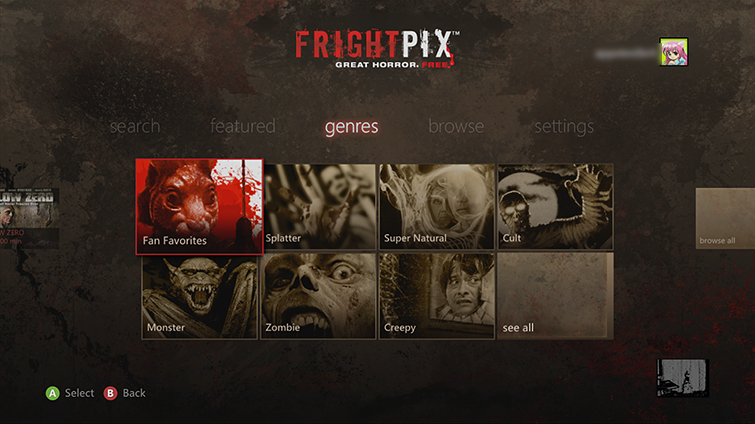 Learn how to set up and use the FrightPIX app on your Xbox 360 console. At least 138 megabytes (MB) of available space. 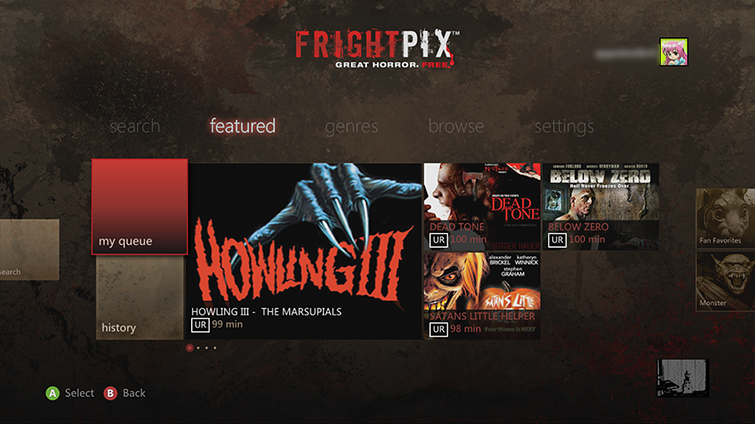 Select FrightPIX to download and install the app. After the download, the app automatically starts, and you can browse through and view details about the available content. To start the FrightPIX app later, go to apps, My Apps, and then FrightPIX. From the Xbox Dashboard, go to tv & movies. 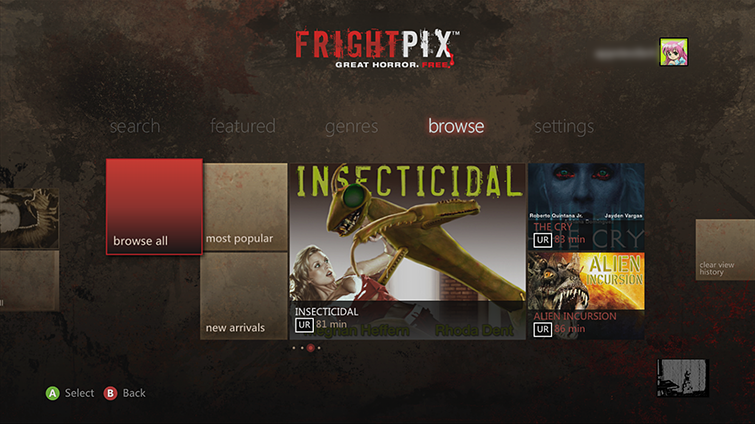 Select My Video Apps, and then select FrightPIX. Watch any of the programs displayed in the center. Select my queue to browse content that you’ve marked for later viewing. Select history to review what you’ve watched and either continue or restart a movie you previously viewed. genres - to browse content by categories within the horror realm, such as Fan Favorites, Splatter, Super Natural, Cult, and others. browse – to browse all content or refine your list by new arrivals or most popular. search – to find content by name. If you use Family Settings to control which movies and TV shows can be watched through Xbox Live, the FrightPIX app will follow those settings. For example, if you prohibit viewing of R-rated movies or TV-MA-rated TV shows, those programs will be marked with a “restricted” icon in the FrightPIX app. To play a restricted item, an adult must enter the Family Settings pass code. ¿Quieres contactar con el Soporte técnico con referencia al problema "Set up and use the FrightPIX app on Xbox 360" acerca del que estabas leyendo o con referencia a otro problema?